When you collect a color swap powerup, press Q or the left mouse button to switch to the color on the left side. Press E or the right mouse button to switch to the color on the right side. There's a lot of interesting stuff at work here, including a new kind of control scheme I hadn't tried: a plaformer with WASD movement still using space to jump. I appreciate the reasoning behind using the mouse. It's quick and intuitive which color to click. Flip side, that hurt my hand, a lot. That's not a particularly comfortable control scheme and I wonder if you could have integrated the mouse in a different way. Maybe, for instance, putting jump on W? Using space in this case felt clunky and provided a pain feedback that wasn't pleasant as the player. It took away from the highlights of your game. Yes, it was self imposed, but I run in the school of thought that a designer should protect the player from themselves. If you bring in an interesting control scheme like that, the player will want to try it. Otherwise the mouse would've just sat there and that would've been a waste of programming. I do want to emphasize though, the pieces are all here. Props to you for doing something so risky and challenging. Just the harder the game, the more finessing there needs to be. EDIT: I took out the stuff about the bullets. You address it beautifully and on re-reading it I don't think it came across in the respectful tone I meant. Sorry about that, I'm glad you made the game you wanted to make as a duo and I only have the most respect for the work you've done. WASD to move and space to jump is actually what I'm use to. Sorry you didn't like the control scheme. As for the bullet part. Henry(the coder dude) got that wrong. I didn't like the bullets in previous builds when they were REALLY fast and inconsistent, once that was changed it was fine. 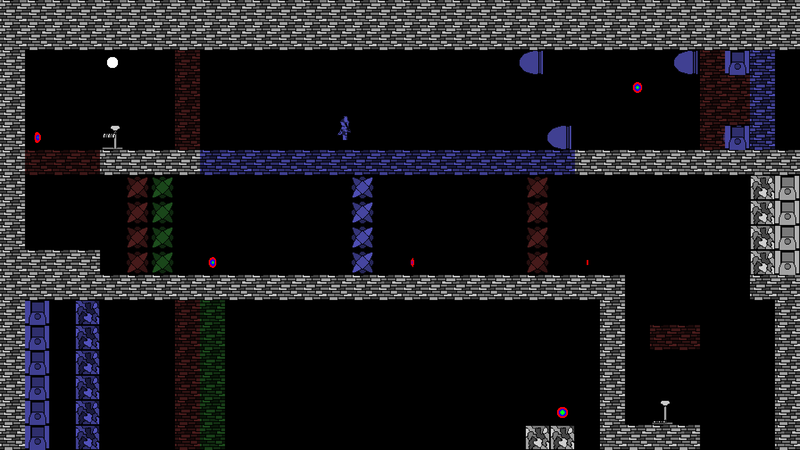 The bullets moving while everything was a choice made so that there would be another level of difficulty besides the platforming. I personally love hard platformers so I didn't find any issue with this. Different strokes for different folks I guess. Thanks playing the game and taking the time to write this much feedback. I found this game very hard. I did not understand how the colour changing platforms worked. Sometimes they'd go solid, sometimes they'd disappear, but it wasn't clear to me what order I should be doing this in. I couldn't get very far in this game, but the aeshetic is very nice and it feels polished. I think it just needs to be balanced a bit more for new players. Sorry you had trouble understanding it! The way the colored platforms work is that platforms that are the same color as the character are solid, while platforms that aren't the same color are not solid. I guess it's that game design issue of thinking a mechanic is obvious because you're the one who came up with it. Thanks for playing anyway! The game was fun, definitely! The movement controls were fun and the switching mechanic was fun. Didn't enjoy the bullet run swapping puzzles though. ;P Otherwise, definitely a job well done! Glad you enjoyed it! My partner on the game also disliked the bullet puzzles at first, but they have a soft place in my masochistic heart. 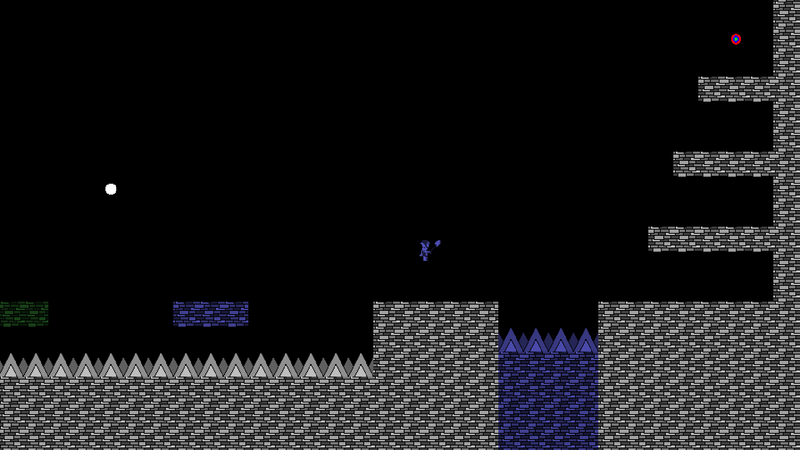 I'm bad at platformers, so I struggled to get past even the first level. Embarrassing, I know. I couldn't figure out how to get on the second blue platform from the green one on the right side of the level. Guessing I just didn't understand the color switching mechanism fully? I liked the music a lot, and the double jump/glide abilities were fun to play with! EDIT: I missed the full controls (I was always left clicking, thinking it randomly picked one). Got through the first level now! Nice, glad you enjoyed it! Sorry the controls for switching colors are a bit obtuse, but we decided it was way faster to control if we bound the colors to left/right click instead of clicking them, especially in the levels where you need to change to a different color quickly. Thanks for playing! Now in color! 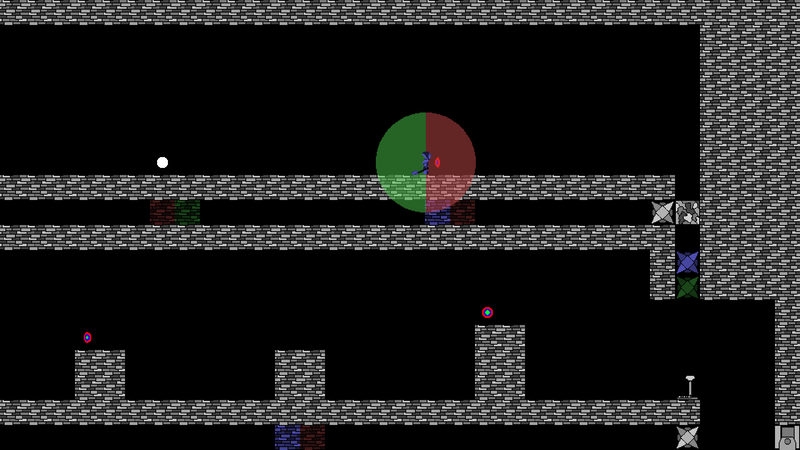 Platform your way through five levels, changing your color to pass through objects.